I remembered reading somewhere that Millennials didn't own cars as much as older generations. Theres been a few stories on that topic such as The young and the carless which says : "Nationally, the average annual number of vehicle-miles traveled by people ages 16 to 34 dropped 23 percent, to 7,900 from 10,300, between 2001 and 2009". Then the article Young Americans ditch the car says that "The share of new cars purchased by those aged 18-34 dropped 30% in the last five years"
Given that trend away from cars for young people, I wondered to myself if Millennial were trading auto debt for student loan debt. The 2010 Survey of Consumer Finances (SCF) I pulled the version that is adjusted for 2010 dollars so these numbers are all inflation adjusted. I only looked at families with a head of household that was under 35 years old. Thats the youngest family group that the SCF splits up. I looked at 4 types of debt. 'ed' is educational or student loans. 'auto' is automobile loans. 'other' would be other types of installment debt. I'm not sure what all falls in that 'other' category but I bet things like medical debt or boat loans. Then 'cc%' is the credit card debt. You can see there that the % of families with car loans did drop steeply from 2007 to 2010 and it went from 44% to 32%. At the same time the % of families with student loans went up from 34% to 40%. 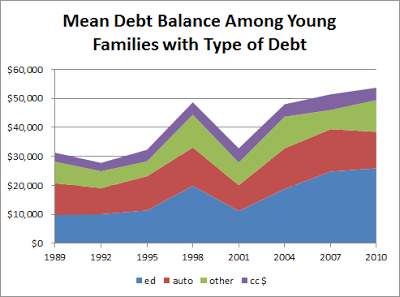 There was an almost equal % of families that dropped auto loans but gained student loans. Again we see the trend that auto debt was down some from 2007 to 2010 while student loan increased. Auto debt dropped $2000 from $14,600 to $12,600 and student loans were up $1,100 from $24800 to $25900. Even among families with each debt we see student loans going up and auto loans going down. However we also see credit cards go down and other loans go up. 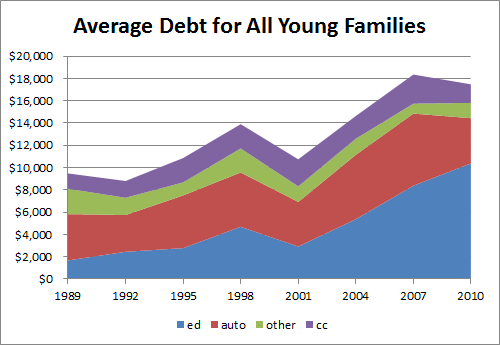 Finally I figured the total average debt for all families with head under age 35. This combines the % of families with the debt and the amount of debt to find the average debt for all families whether each family does or doesn't have debt. 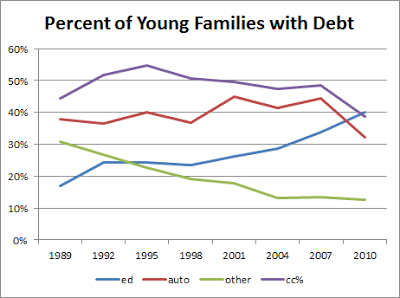 Again we can see the trend from 2007 to 2010 is an increase in student loans and a decrease in auto loans. Student debt went up by $2,004 and auto loans dropped by $2,411. Credit card debt also dropped going down $955 but other loans were up 482. The total average debt did drop from 2007 to 2010. Before we read too much into this I should point out that the debt balances were down among households in general from 2007 to 2010 regardless of the age of household head. So the fact that auto loans dropped for young families is not unique and more a reflection of the poor economy and tight credit. Auto buying plunged pretty drastically around 2008 and 2009 as the economy plunged into recession.